There are 741 posts in this topic. You are on page 1 of 15. Hi guys. Been thinking about doing this for a while. We need a place where we can discuss all things SprayMax 2K. I started using this product a few months back. It has goods and bads, and I'll be as brutally honest as possible and ask that others do the same in this space. No reason to be a fanboy for an auto-clear in a can. Just the facts and your honest opinions and experiences. I've now used SprayMax on three playfields, including one in progress. Lots of pics at various stages. SprayMax 2K is essentially nothing more than two-part automotive clearcoat (2PAC) in a can. By using a special can, they separate the clear from the catalyst hardener until you are ready to mix them. First you shake the can for 2 minutes. Then you press a button on the bottom to mix the clear and the catalyst. Then you shake for two more minutes. Then you spray. Those who know 2PAC would point out that there are different types (speeds) of hardeners and that mixing differently provides different experiences. They would also point out that once you have the mixed clear in the gun, that you adjust your gun accordingly. Well, SprayMax 2K doesn't have such adjustments. You get what you get. SprayMax 2K is not for everyone. 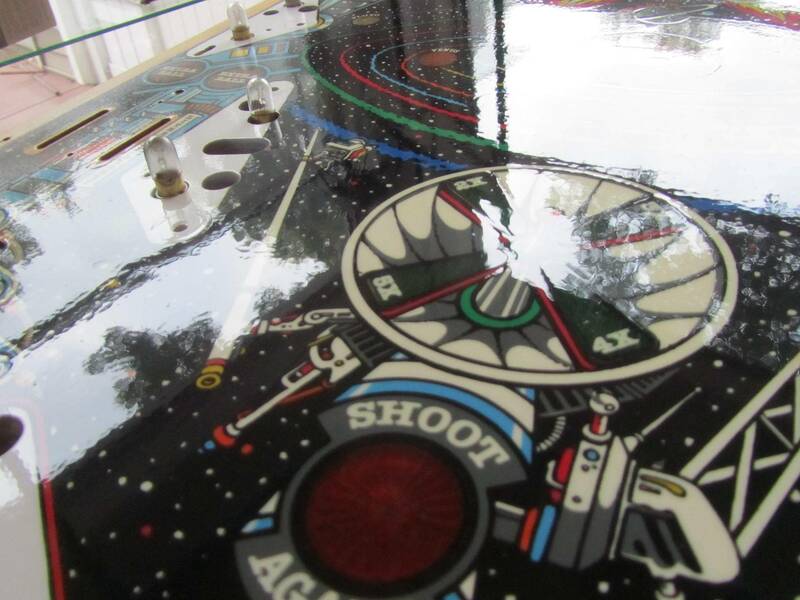 When shooting pinbot, I listed out the pros and cons. Here they are. -Gives the finish you'd expect with auto clear. Colors are AMAZING! 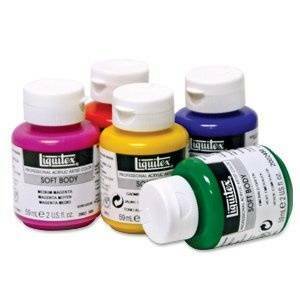 -No possibility of contamination or dried glops in your clear. -Nothing to clean up after spraying (less time in the booth no spraying laquer thinner into the air). -Eliminates the need for the line filter, air compressor, a clean hose, guns, etc. -Gives you an option to "demo" auto clear to decide if the toxic product is something you are even interested in using. -Versus mixing your own, you may have to shift your schedule a bit based on the shelf life of the can. It's bricked after 48 hours, so you have to spray on consecutive days if you require two coats from a single can. -You have no flexibility of "fast" or "medium" catalysts as you would with mixing. 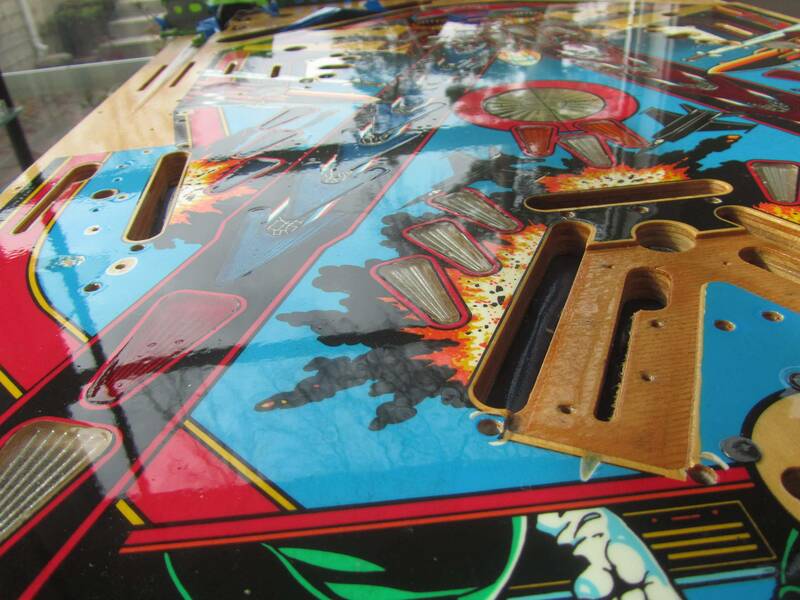 -For lowered inserts you have to spray into a jar, then use a syringe to get it out, then apply it to the playfield. Not terribly convenient, and once you spray into the jar, you just started the 24 hour clock on the whole can. -There is less support available and less "known" about using the product. I get mine at Napa for $20 per can. 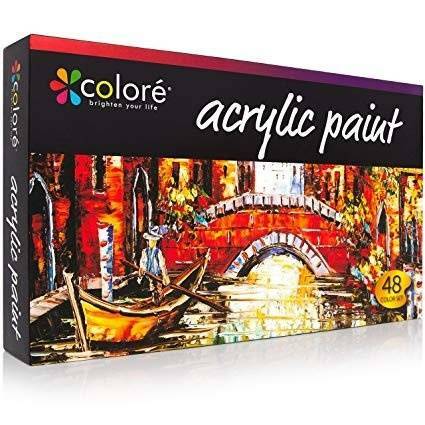 They have a shelf of it and say they recommend it to all their amateur painters. I've also bought from http://www.repaintsupply.com/pd_2_part_2k_aerosol.cfm. for $25 shipped before I realized Napa carried it. SprayMax 2K is just as toxic as the 2PAC that you shoot in a gun. No more, no less. If you don't want to die young (I'm not being dramatic here) then you need to take all the necessary precautions. 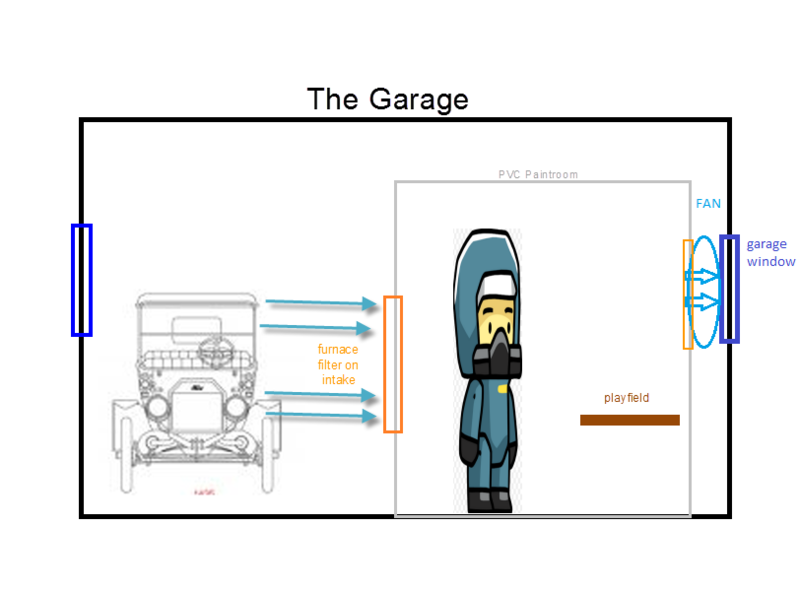 You need to use a respirator approved for isocyanates. I also wear a bunny suit and swimming goggles and big shop goggles over those. Don't be an idiot, seriously. 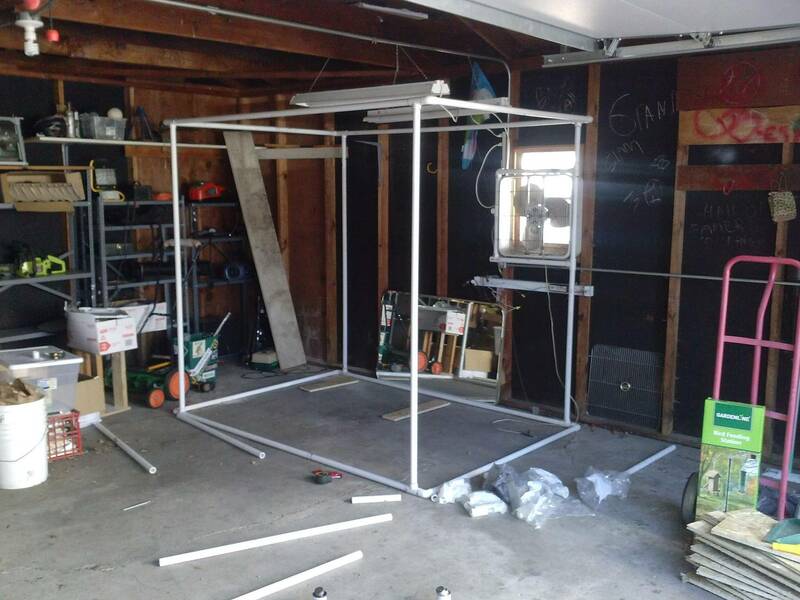 I also created a cross-draft spray booth. For those who don't know what this is, it's a dedicated room with a furnace filter on air intake to ensure that only clean, dust-free air enters your space. there's a fan on exhaust and another air filter that ensures clearcoat particulate is captured so you don't poison your whole neighborhood. 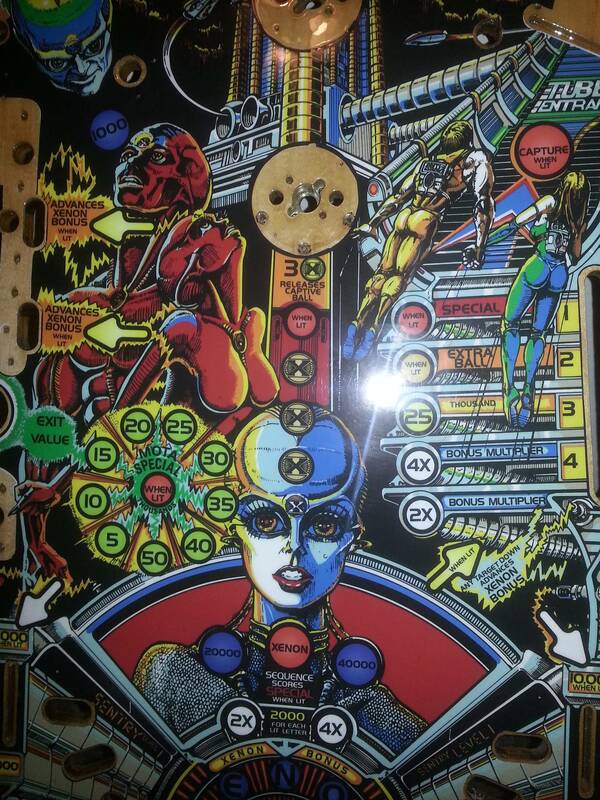 This is pinbot. I had absolutely no idea what I was doing, but I laid down a pretty thin coat. You can see two things here. You can see an eggshell pattern and the clear following the planking of the wood. The eggshell is just what SprayMax does when you spray it thin. It's like the droplets need other droplets to form a surrface tension with, and if they don't get that, they look like a million droplets combined. The planking is just the clear following the contours of what's there. My F-14 Project is a work in progress, but things have not gone nearly as well. In fact, it's been a bit of a disaster, albeit one that in the end I know will be a success. I think it's important to document failures as well as successes here. That way we know what to expect and what to avoid. 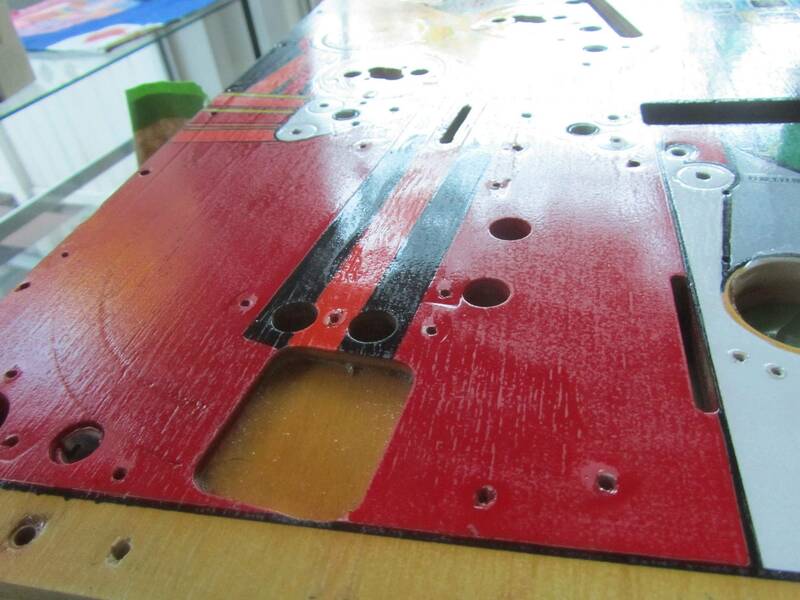 Whereas with my pinbot I put down a thin first coat on a warm day, My first coat with F14 was a different story. I was all suited up and ready to shoot when I realized that my spray room was on the cold side. The weather man had been telling us that it would be the last nice day, and the forecast was 60 by 2 pm. I watched the weather all day, hour by hour, and they were way off. It never got as warm as they said. I mistakenly went for the "well, this could be my last chance to spray for a while; I better make it count" approach, which I realize now was the wrong approach. I laid the clear on pretty thick and essentially emptied the entire can. The result was that in a lot of spots it looked great but a lot of spots the clear didn't cover at all. I should note that I did use Naptha, but I didn't apply a ton of force and really wipe it like crazy. 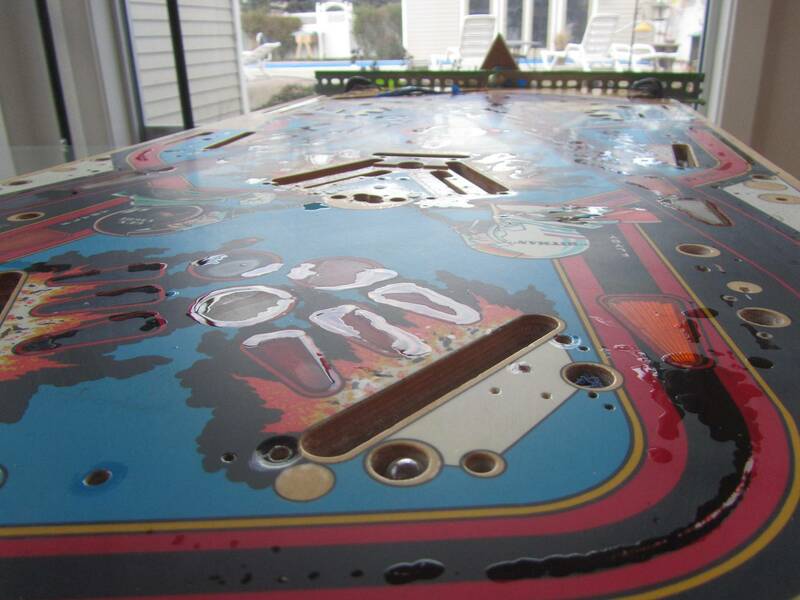 So it's possible there was oil on the playfield in the spot that seems to have repelled the clear. So now I'm in disaster recovery mode. I sanded the mess pretty aggressively using a drywall sanding pad. 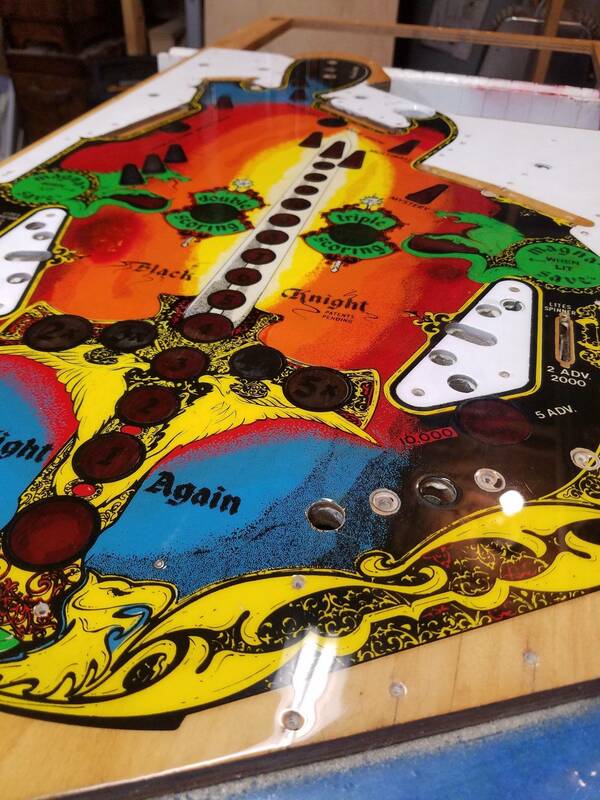 By aggressively I mean I sanded into many of the inserts that were high, sanded off the raised spots under the posts, and basically tried to get as close to flat as possible without hitting the original coat. (sorry, didn't take pics after it was sanded). I then put down yet another thick coat. At this point it was officially too cold to spray, but I put in two portable heaters and got it as close to 70 degrees as possible. Then I unplugged them, put a towel and a cardboard box over the heaters to prevent the still-glowing heating elements from starting a fire, and I sprayed. Afterward, I plugged them back in and shut off the fan. This time I used maybe 1/2 to 3/4 of the can. Here is one pic while still inside the paint room (wet) and a couple more the day after. This time thankfully I didn't have the issue where the clear didn't seem to want to stick to a specified area, but I had some bumpy areas even after previous sanding where the clear didn't flow down into and fill (sprayed clear doesn't do this, I've found). 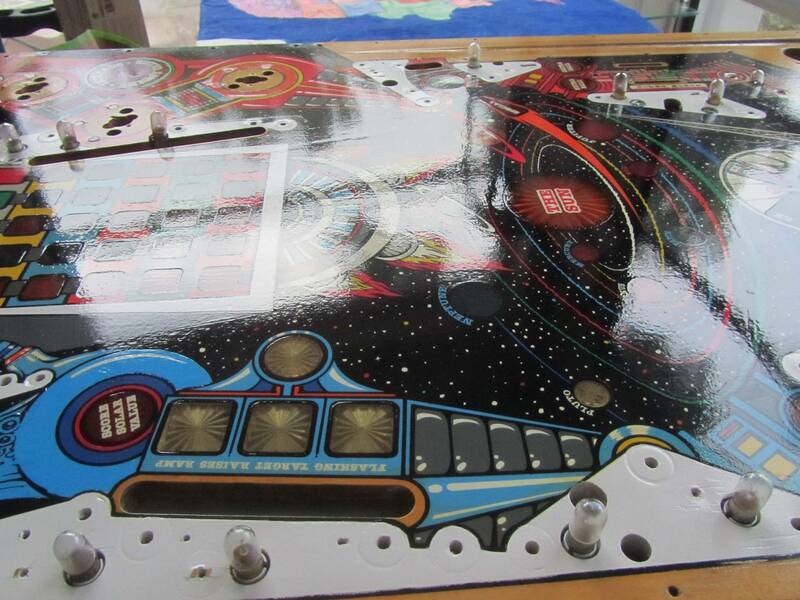 One thing I might mention is that when I glued down my inserts I did get some on the playfield here and there. I cleaned this up with 91% alcohol and also cleaned my hands with it. Seemed to all come up, but also note most of the places where I had adherence probs are next to an insert. So, what do I think caused this? Not sure, but I am leaning toward a combination of things. First, it was colder than it should have been. Second, maybe my prep wasn't top notch. Third, I was trying to spray too thick. I had good results with it. But it's not nearly as predictable as a proper setup. The can, the air temp, the nozzle, lots of variables. Not going to spray the same every time. If you really don't have the time/money/energy/space to invest in a full setup with a compressor etc it's a legit option though for sure. I've used it twice for a Paragon and Space Invaders restore. I've also used it to spray my motorcycle tank and fairings. The stuff is absolutely fantastic. I've spilled gas on the tank a couple of times and didn't do any harm. The paint has been holding up well for the past two years. The ONLY thing I don't like about it is that once you activate the can, you have 24-48 hours to use it. The flow and spray control were never a problem for me. Though on one of the cans I did have a problem with the nozzle in which some droplets came out and that later hardened into tiny bumps. Those got sanded so overall is wasn't a problem. I would like to make two posts. This one that is a happy story and one more that is my current problem. My first project with Spraymax 2k was a Spring Break. There where no real problems, really easy to use. Here is one before and one after picture. After doing my Spring Break with great success I was ready for my next project. Goldeneye! I have a 50l compressor but after using Spraymax and saw the result I did not see why I should not use it for my next project. Temperature is dropping to around 50f outside but I thought it was OK. I started spraying and after first layer I saw thousands of small bubbles. I started to panic. So I move everything to a more warm place and turned on the heat 72f. 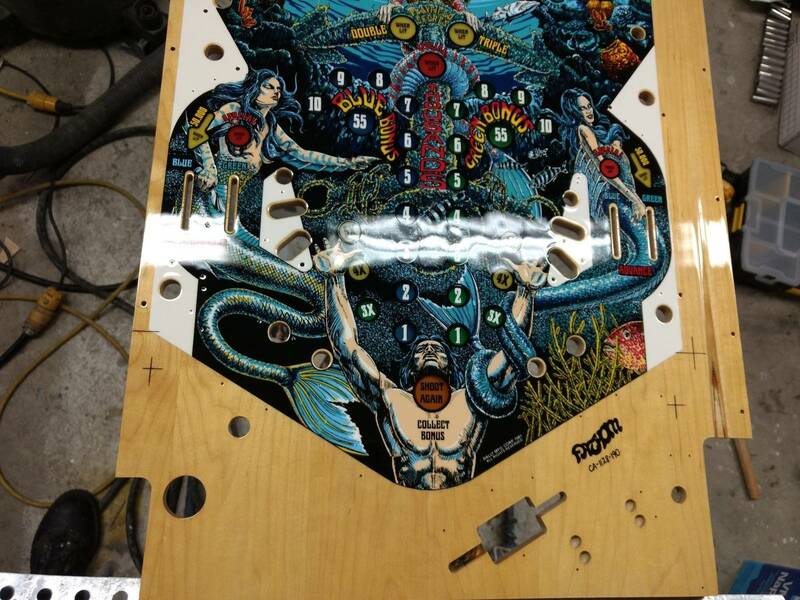 So I asked the great Vid what to do and I sanded the playfield down. I was sure it was because of the low temperature that it went wrong. (I have attached a image of the "bubbles"). 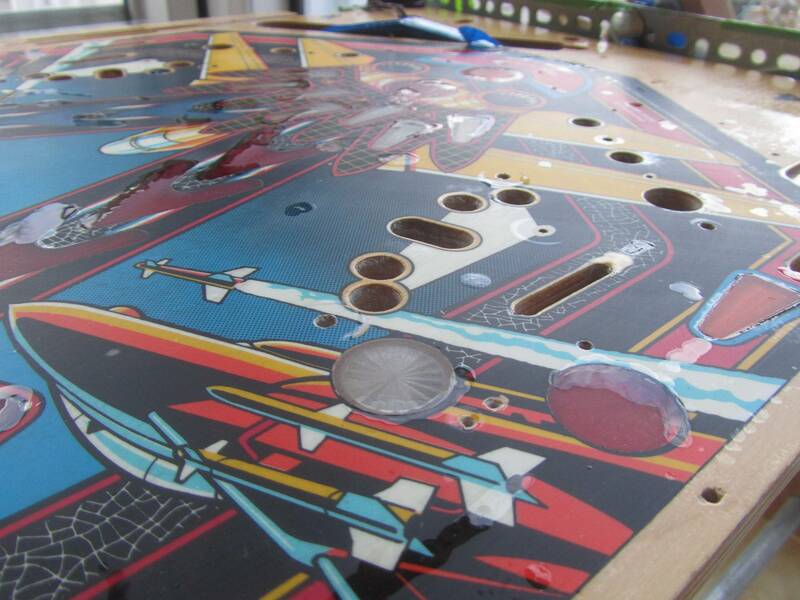 When the playfield was sanded down I wanted to fill up the inserts that was lowered. I took the same Spraymax can that I used the day before. But now I was shocked the bubbles came back when filling the inserts! 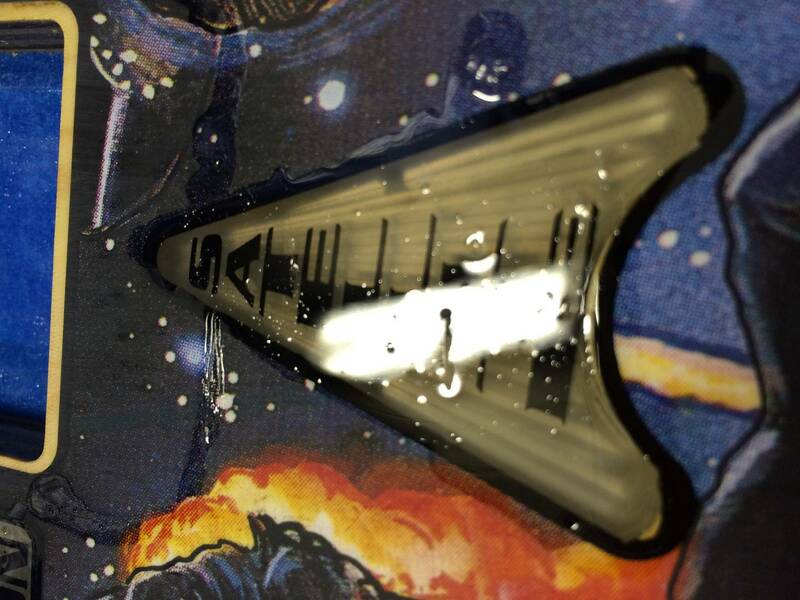 (the other images attached) It seems like when the clear is touching the insert the bubbles form and rise? 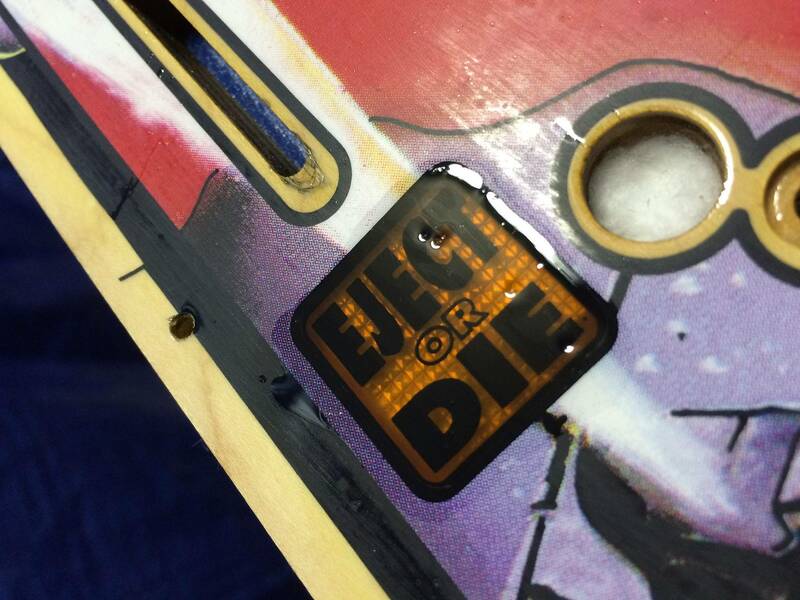 Also if you look at the "Eject or Die" insert you can see some "dips" or "holes" that are on some. Its either that or the small bubbles that are on the other image. The temperature was at least 72f and the method that I use is the same I used on Spring Break with great result. So please help identify the problem so I can finish the project and sleep well at night. 2) I have shaked it to much? Sounds strange if that is the case. No, but you have access to one! Tezing - Glad to have you here. Let's figure this out. Do you think your problem is similar to these spots where the clear just didn't want to adhere? We both had great results on our first projects, then tried a second in too-low temps. What was your process when you filled the inserts? Were you using a syringe? Your image looks like the one of the two scenarios I have ("Eject or Die"). I use Transfer Pipettes and have used them multiple times before without any problems. 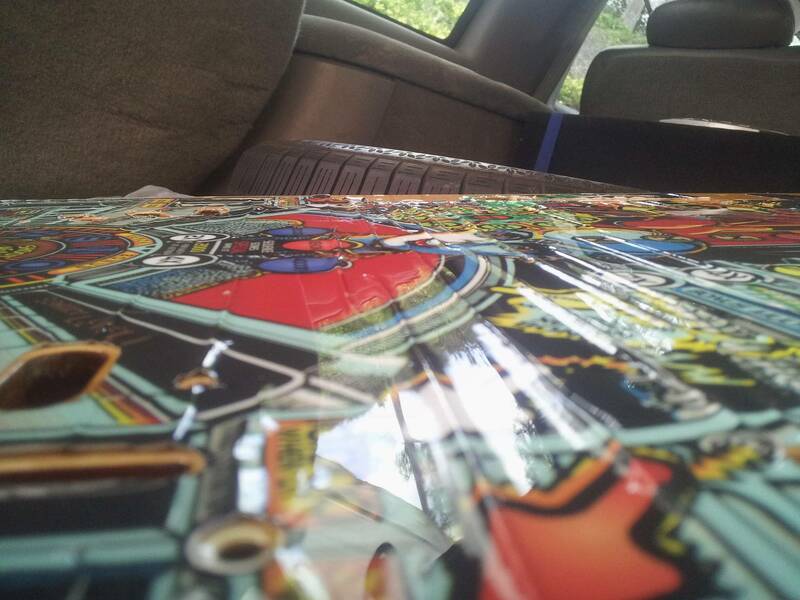 What really stunned me was when I added the clear and I could see air-bubbles being created and lift from the insert. 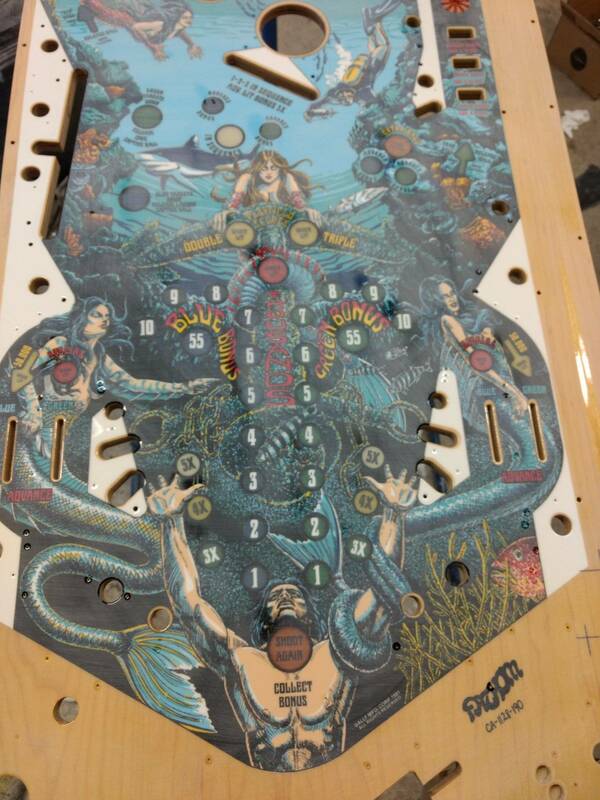 Like there where some kind of reaction between the insert/playfield and the product. So its one of those two that are the problem I think and not the temperatur. So I actually start to doubt if it was the temperatur that created the air-bubbles the last time. - Did you have all your problems with the same can? 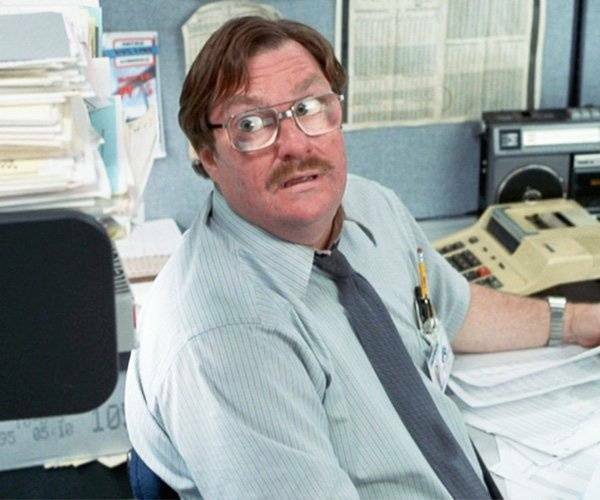 - Did you activate the can with the red dot up or down? 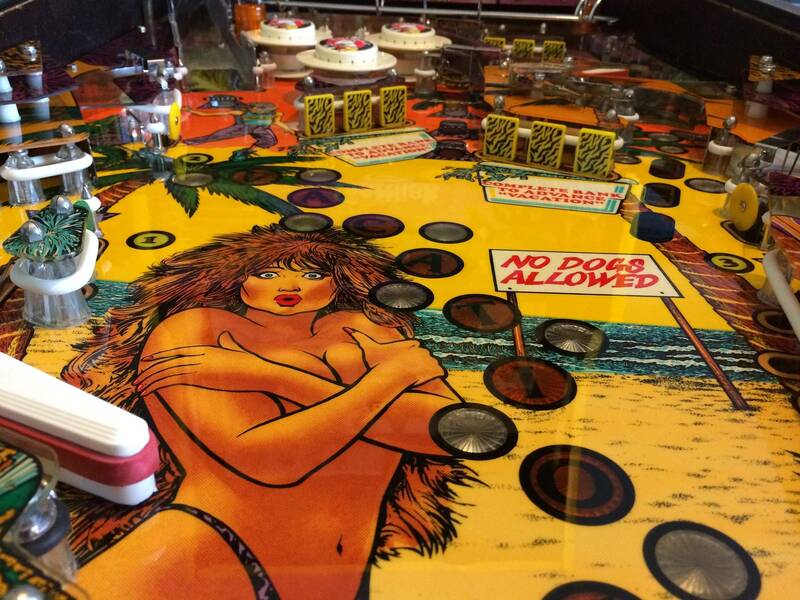 - Are we sure its nothing with making the playfield ready for clear we are missing? - Do you shake the can right until you start spraying? I know you guys cleaned it well but in my industry, the problem you are seeing is generally surface contaminates. I would try in an inconspicuous spot wiping down a test area (want to be safe that the solvent doesn't lift artwork) with whatever is the vehicle spray max is made with and or what it says on the label to clean up with. You are worried about temperature but low temps generally manifest themself by turning the product cloudy in spots. Yeah, fisheye is usually silicone or other contamination. You really have to clean thoroughly. will naptha take care of silicone? Thank you. I had a feeling that this could be the problem but thought I had cleaned it very well. I don't see anything on the product about cleaning? - First I cleaned with normal cleaning product. - Then I used Naptha and really cleaned it. - Then I sanded it down. Okay, this is good info to know. I wouldn't be surprised to hear I'd failed to get it 100% clean. I would describe the wipedown I gave it with NAPTHA has kind of a gentle wipe, like you'd wipe a car you really loved with a soft diaper. Not the kind of thing that was going to remove oils, greases, waxes, adhesives, etc. I mixed the epoxy with a match and then used that to set my inserts, so it's possible maybe some un-mixed and un-set epoxy could have formed a thin layer and repelled the adhesive as well. These are things I've thought of in the days following my bad coat. 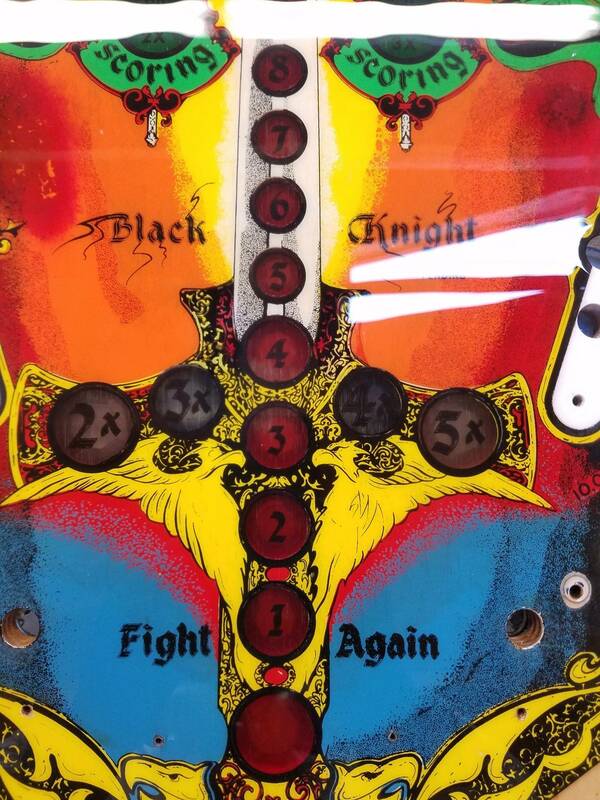 That would certainly explain the large area at the top of my pf where the clear just wants nothing to do with the playfield at all. However, there does appear to be something else going on with the plastic inserts. 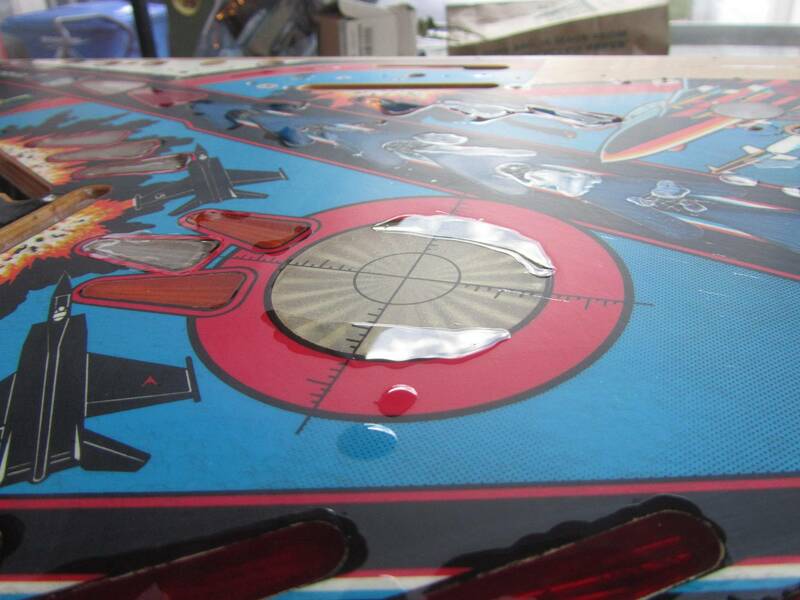 Let me ask you this, tezing, on my pinbot I didn't sand my inserts down to bare plastic -- I just left the old, cracked clearcoat on there. I didn't want to open a can or worms I didn't have the skills to address. On F-14 I got some confidence and decided to pull and sand every insert. 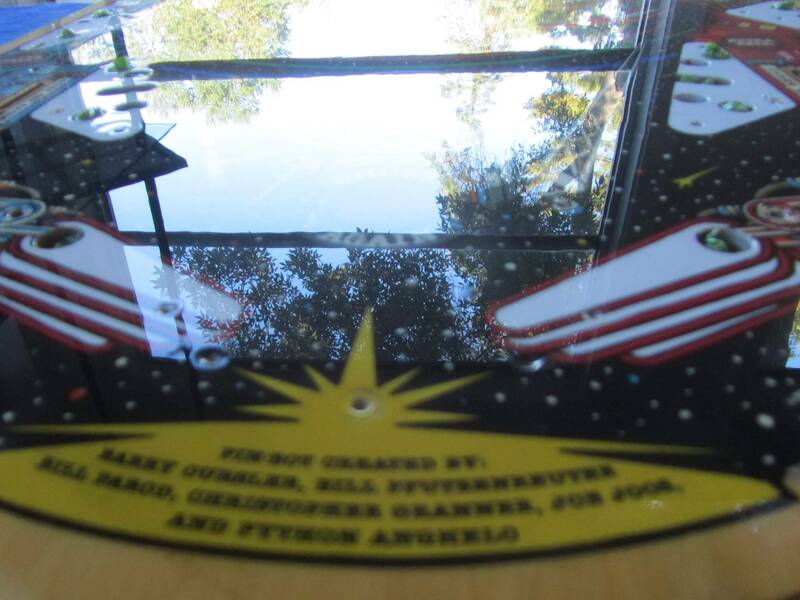 So this is the first time I see the clear directly on the plastic of the insert. Maybe a chemical reaction? 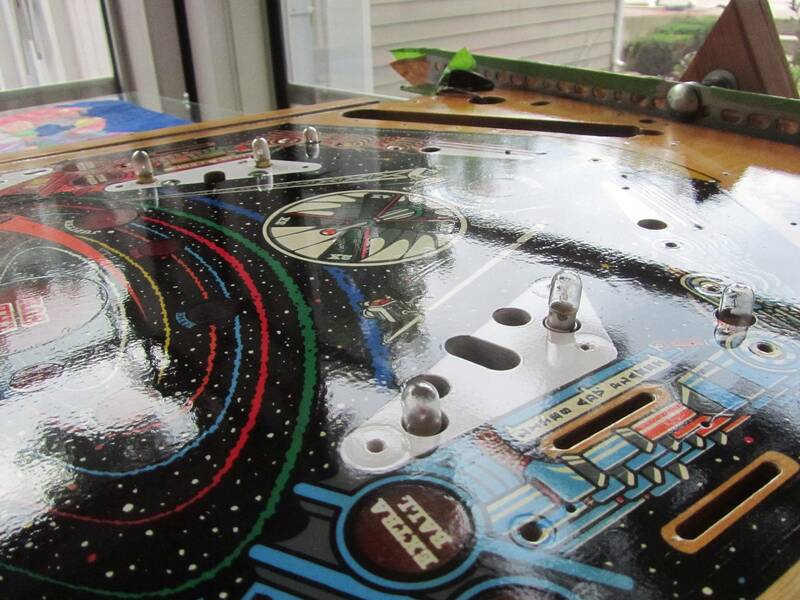 What about you -- did you clear on the existing finish or directly on sanded, bare plastic inserts? 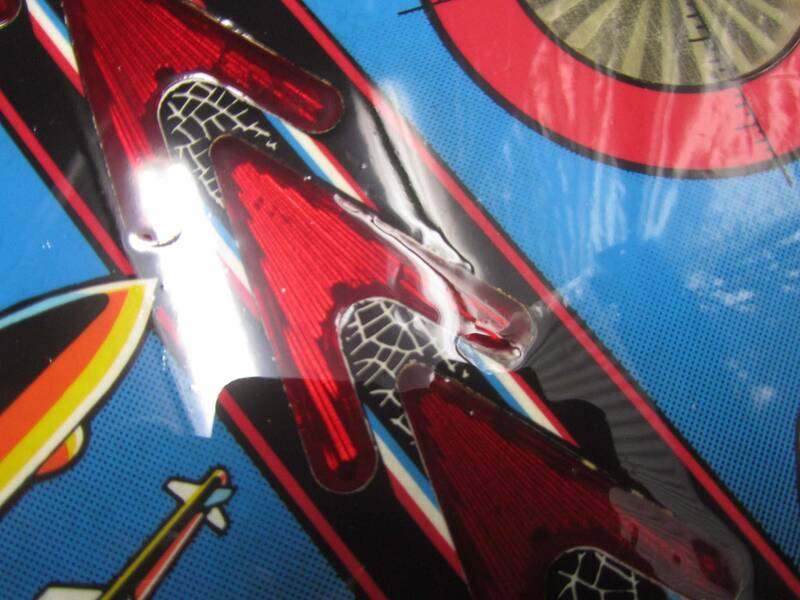 On my Spring Break I used clear on waterslide decals and directly on bare inserts without any problems at all. The problem I have now on inserts are all on the existing clear. No, you need to use a specific "grease, wax & silicone remover" product that's designed for surface preparation. 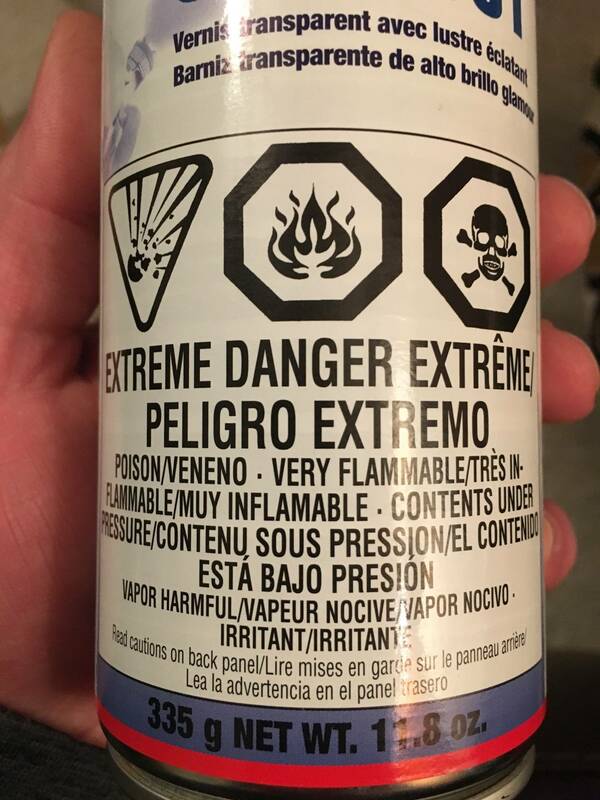 The label on the can tells you what solvent it's cut with. 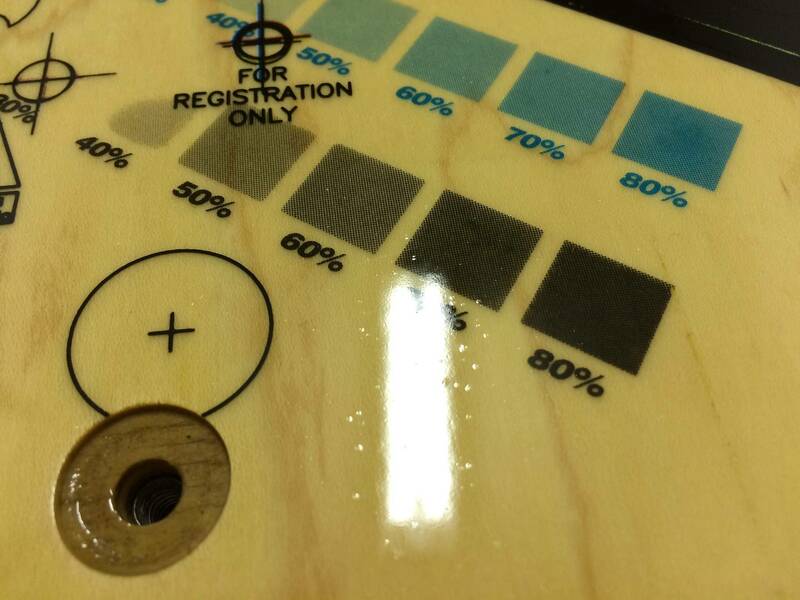 Use that but be careful, most epoxies are cut with aggressive solvents. Rapid Tac is a good cleaner too. 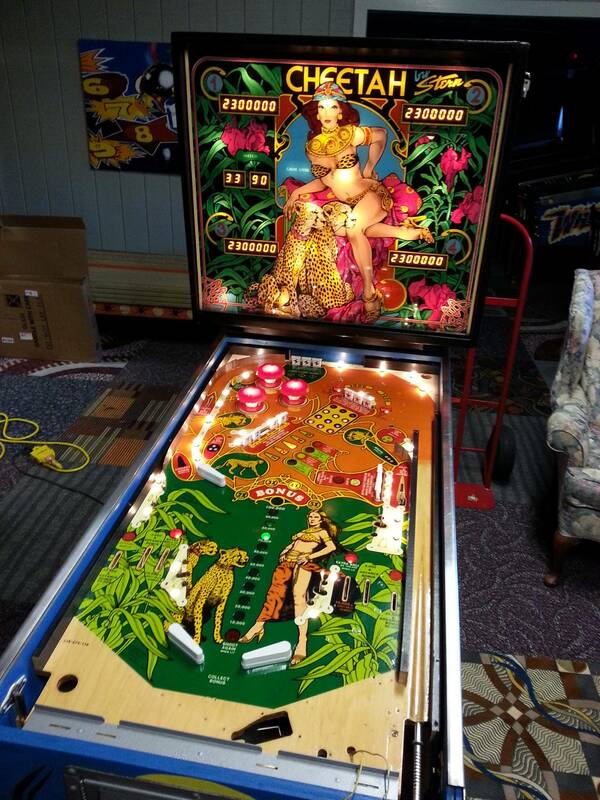 Will I be able to save the playfield i am working on? If I sand it down and there are still small "dips" will the cleaning go down there and clean it? (I guess there is a problem since there is a dip) Or what should I do? 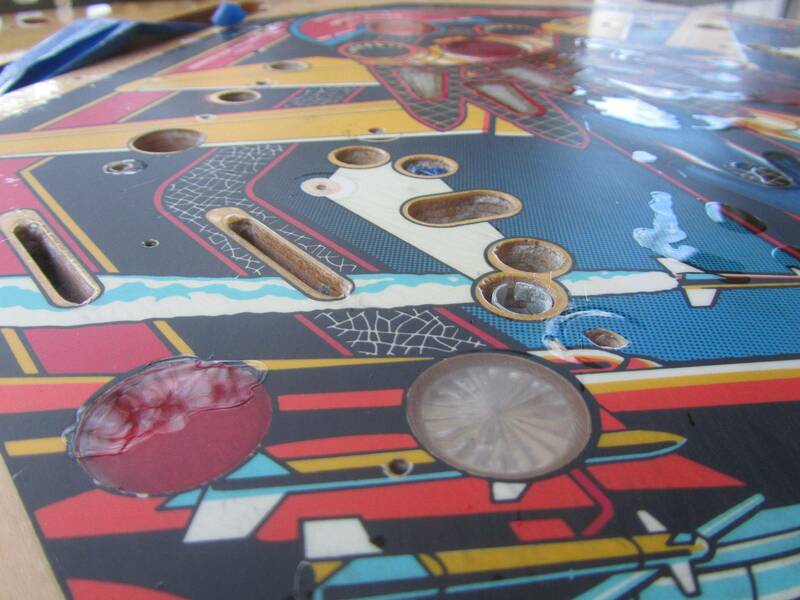 My whole playfield are full of tiny craters/dibs from sanding down a layer of clear with air bubbles. Will this have any effect on water slide decals, or acrylic touch up paints? Yes, don't worry that it won't be great. It will be. 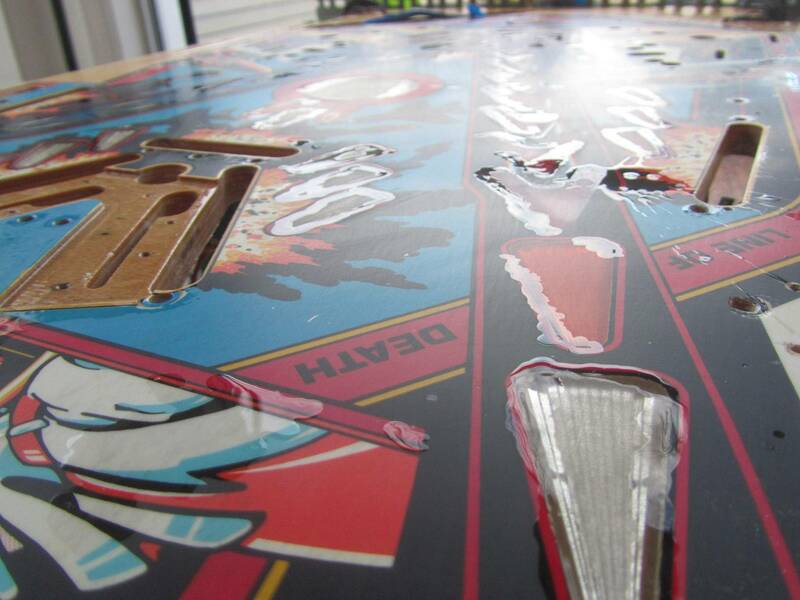 You will just end up wasting more cans of clear than you wanted and doing way more sanding than you expected. My F14 was a disaster at the first coat, and I still need to post the pics of my most recent coat, but it's looking great -- one more light sand and ready to paint the keylines. It's not that it won't be perfect in the end, just a lot more work than you wanted. I'm considering not re-clearing until Spring. That's a long time for a game to sit, but what can you do? It's crazy cold out there. 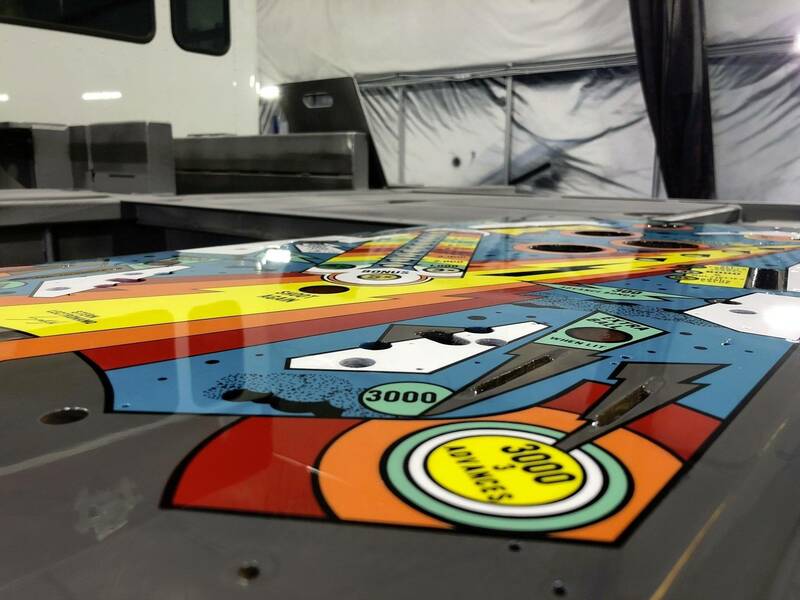 The only picture I took of the Cheetah playfield after using Spraymax 2K. It turned out ok, not perfect but ok. There is one thing that I find strange and hope you guys can help me solve. 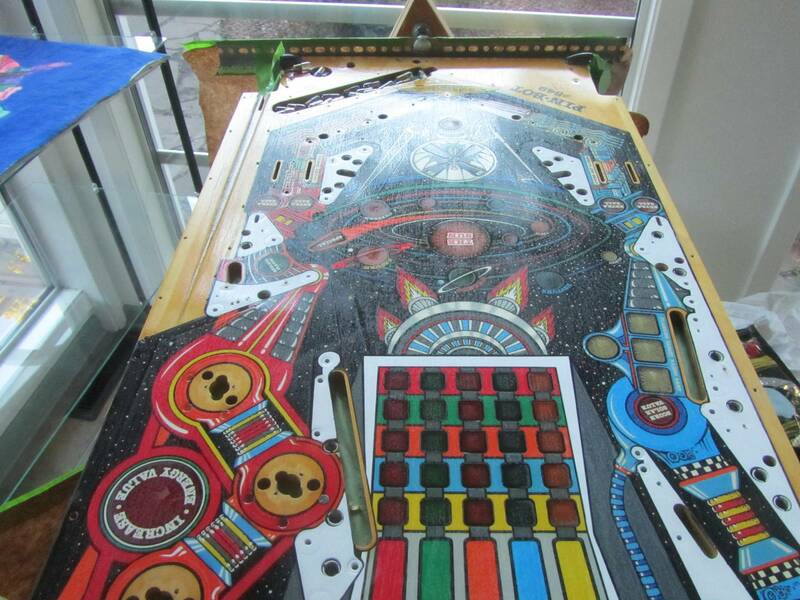 If it is because the playfield has contamination why did I also have the issue under the apron? 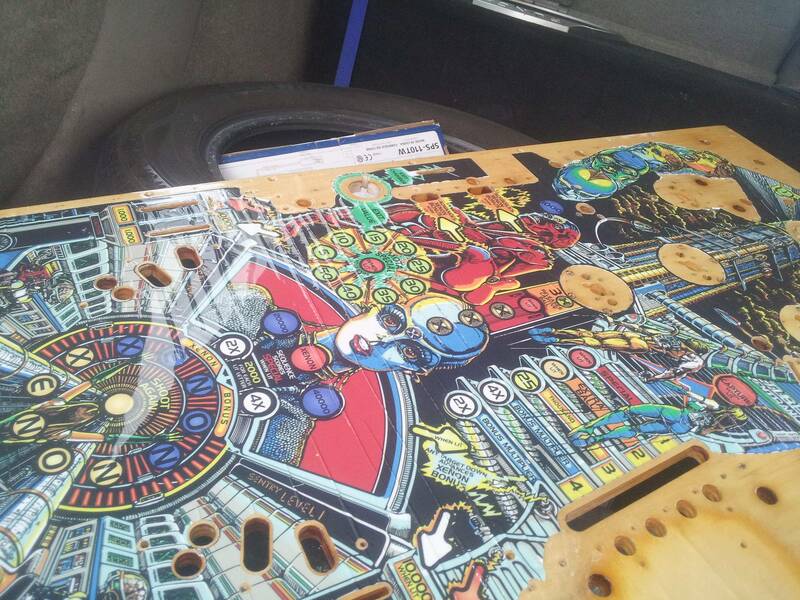 Is it because Sega threaded the playfield with something after they cleared it? Or have I distributed the contamination some have to under the apron? The problem with any spray can type application (doesn't matter which one), is if there is surface junk (wax, silicone, etc), you will get fish eyes and adhesion issues. and the problem is, even if you clean the surface real well with a good cleaner (naptha, etc), it's almost impossible to get all the contamination off. 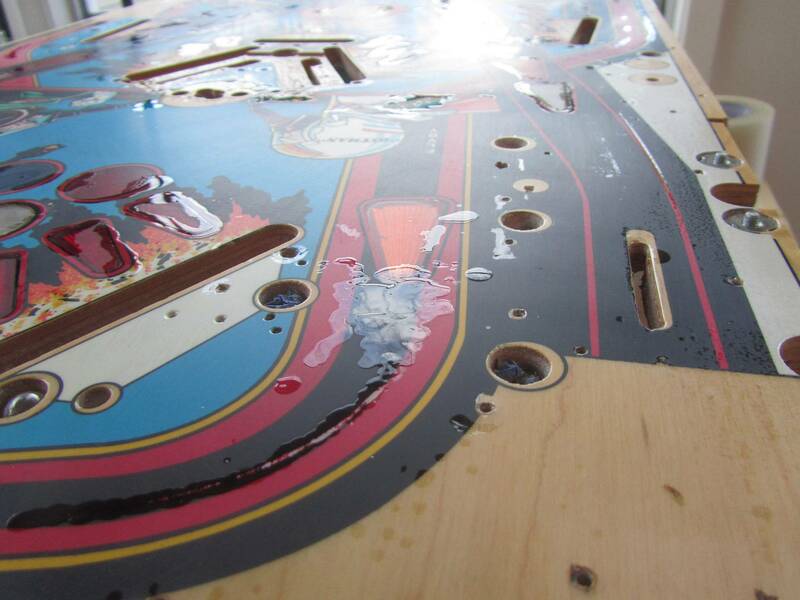 Especially if Millwax was used on the playfield in the past. The best solution is to spray using a standard gun type system. this way you can easily add fisheye remover to the clear. Using a spray can (any type of spray can) does not allow this. there's really no way around it unfortunately. the good news is that a compression and gun are now fairly inexpensive (china stuff). They are no Binks but they do work well for occasional usage. as for under the apron question, it's really hard to say what the history of anything is. who knows what could have happened in the last 30 years? this is why i always spray with a fisheye eliminator, so you don't get "surprises". 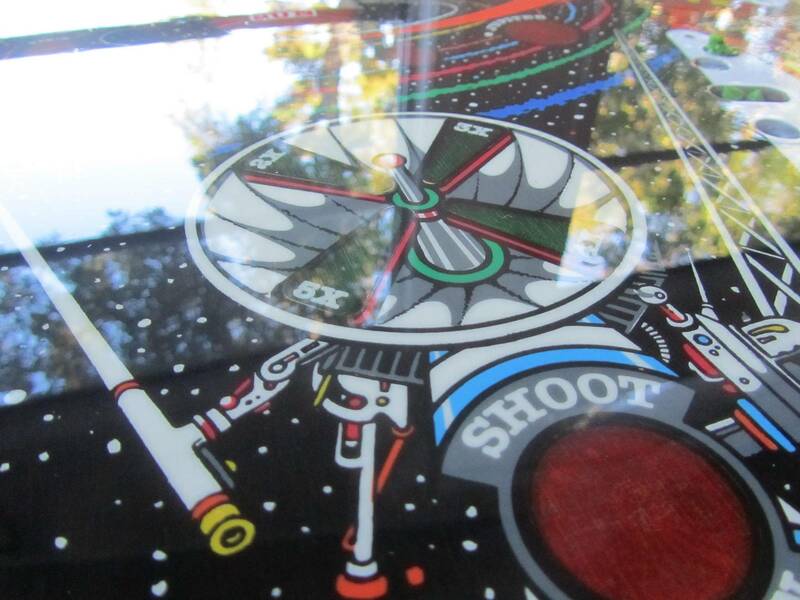 Trying to rid a cleared playfield of fisheyes is very frustrating and time consuming. best to just avoid them in the first place. I bought 6 cans, including shipping, came out to be $19.27 each from here. Has anyone used MoTip 600 Degreaser ? 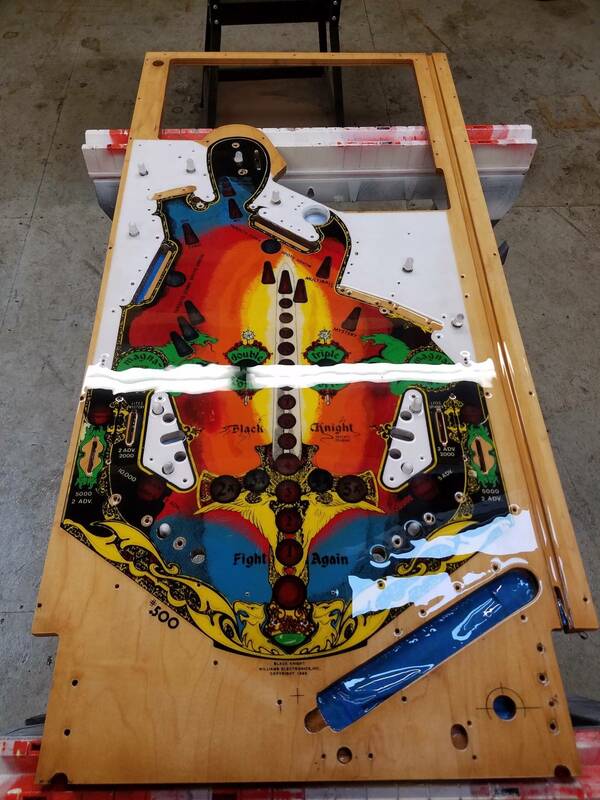 Could anyone help me decide if this a good solution for cleaning playfield? I had good success clearing TFTC. Sand, naphtha, tack cloth, and spray. I had thick gloves so I didn't notice my finger blocking the top part of the spray - it caused droplets. Sanded them down with no issues. I learned a ton and I would do it again. Thanks for your input. Totally agree with you that this is the best way to get professional looking results, bar none. I've personally gone the Spraymax 2K route for probably the same reason most other guys have. 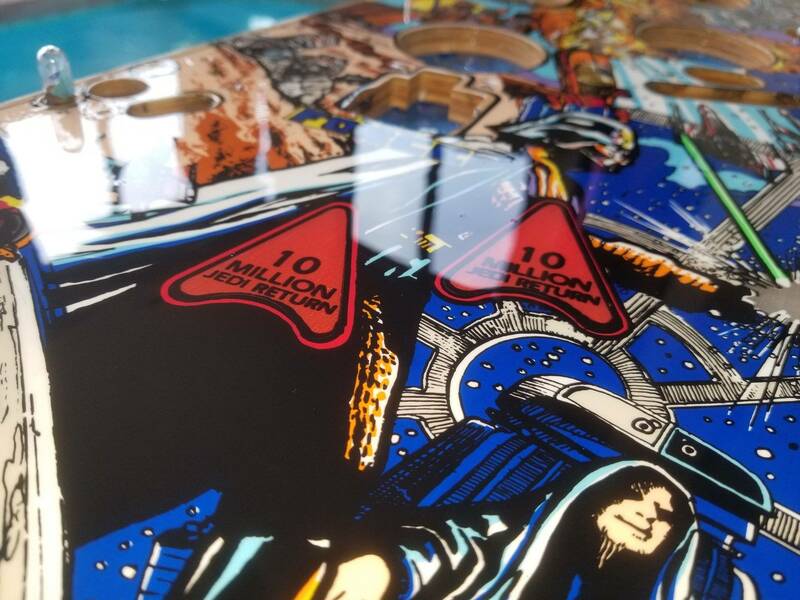 I only do 1-2 playfields per year, I wasn't sure if auto clear would be for me, etc. I am now re-thinking that, for what it's worth, but still feel it's valuable to have a space like this to discuss the SprayMax option. I know this is off topic, but in some of your initial tests with auto clears many moons ago you had good results using a foam brush. 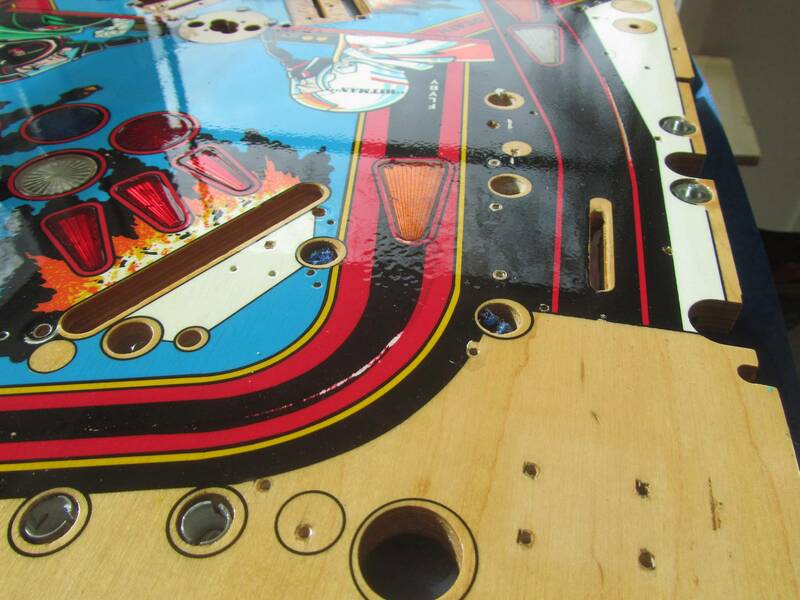 I've had great results painting cabinets using a foam roller and have given thought more than once to trying this in thin coats to clear a playfield. I know it would require sanding between coats, but it would eliminate the scariest part of the process for me which is all that toxic overspray. I'm just curious, have you moved on from the foam brush and do you now spray only? Do you think if a guy used a foam roller and had a s__t-ton of patience that he could get a professional result? Those results on your Paragon are great! Nice job on that. Wow, Spring Break really came out nice! That's impressive work. Colors really pop on that Cheetah. Picture is a bit too grainy to see the finish you ended up with, though. How many coats did you do? When you say it was just okay, do you mean it looked kind of egg-shelly? I have found that your lighter coats will be eggshell, then you have to sand the tops off, then more egg shell, then sand the tops off, etc. Finally if you spray a thick final coat you will get the more show-room finish. I put 5 coats on that Cheetah. Some areas ended up very nice but other areas had some orange peel. I think it was all due to the prep beforehand. But for a free game, I'm happy. 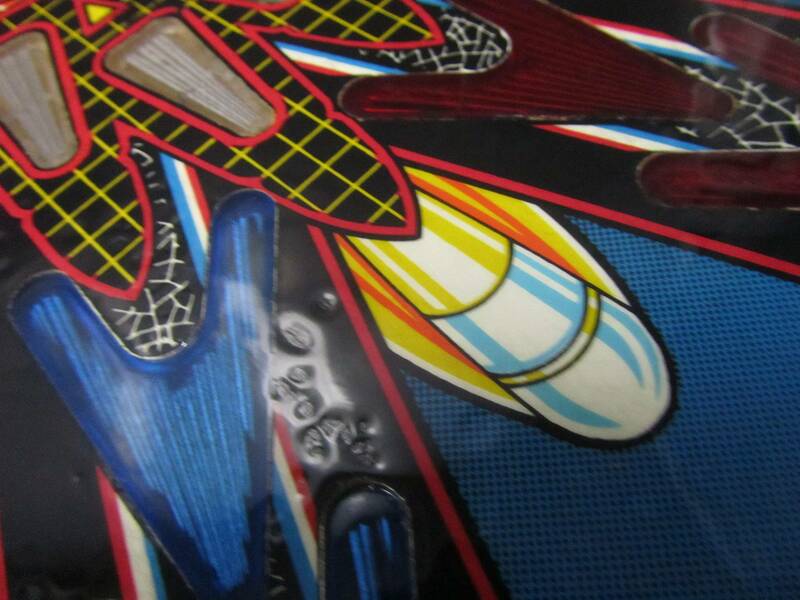 be very carefull on first coats over decals and overlays. my first experience with spraymax I layed it on thick first coat . only to come back and find this happened to my xenon overlay . Did you have all your problems with the same can? 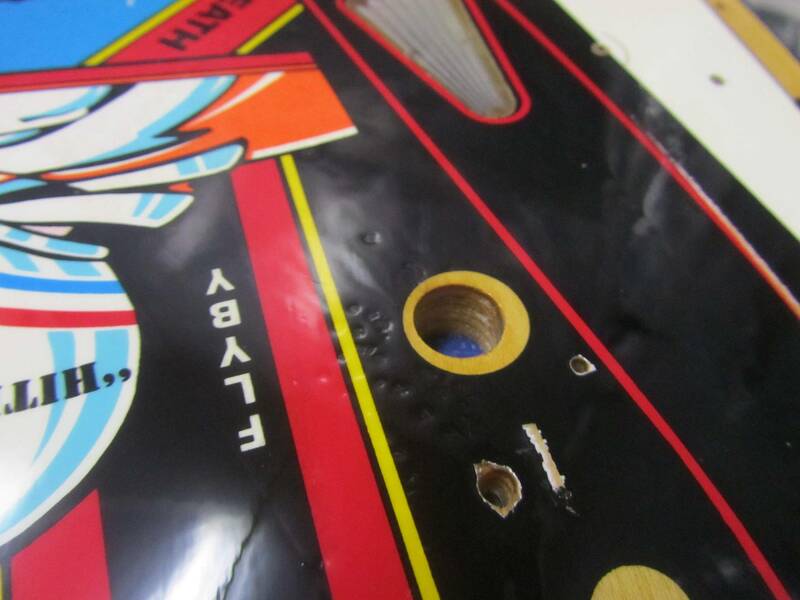 My 1st bad coat (when the clear kind of repelled from a couple areas on the playfield and inserts) was from one can, but I don't think there was anything wrong with that can. I think it had to be a combination of temp, prep, and a too-thick first coat. Did you activate the can with the red dot up or down?
? Not sure what you mean. I put the red plastic thingy on the bottom of the can, push it on the ground, then shake it two minutes. I generally press this trigger several times to make sure the catalyst got into the clear. 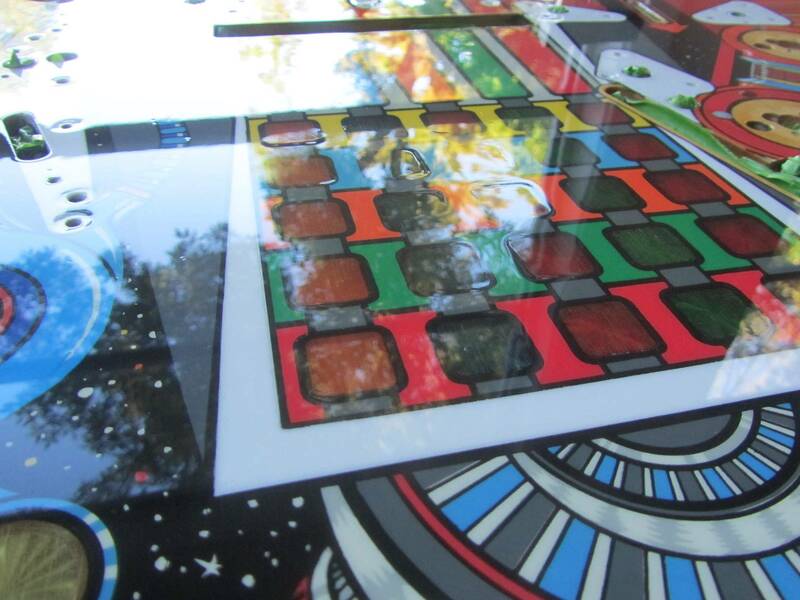 Are we sure its nothing with making the playfield ready for clear we are missing? In the case of my first bad coat, I think prep was an issue. 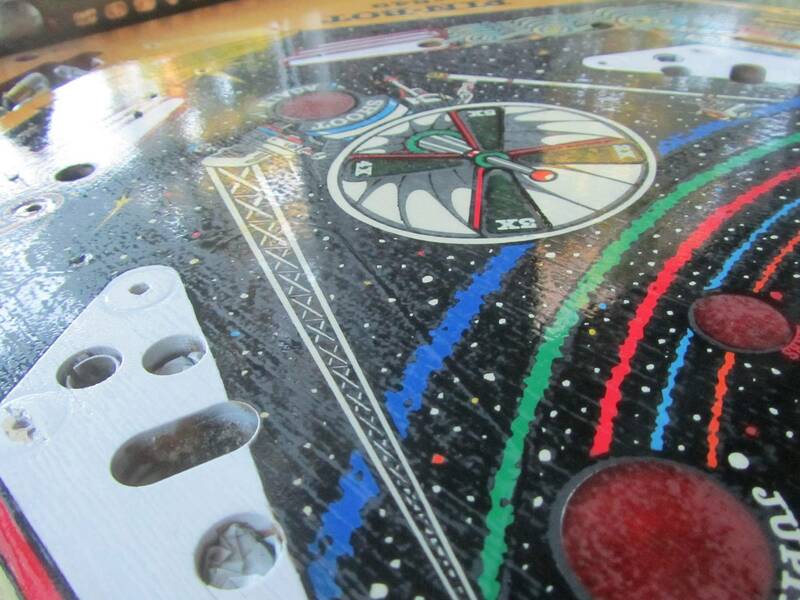 As for the tiny pinpricks I have on my playfield from my third coat, I just think this is temperature-related. 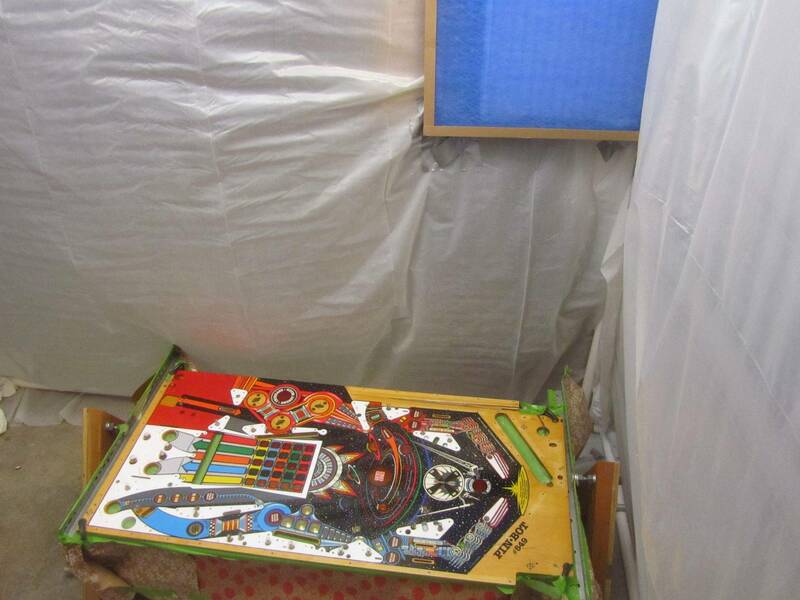 Playfield/current clear is one temp, air is another, clear in the can is yet another, then after clearing I heat the spray room, which is another. I think this raises very tiny solvent pops. Just a theory, but I think it's unrelated to the other issue. Do you shake the can right until you start spraying? I do, then I shake some more after two passes, then some more as I spray the rest out. Oh yikes! It melted your overlay? That must have been so depressing. Kudos to you that you didn't drive the machine over a cliff but hung in there and re-did it. Looks great now. Yes, I used this since I had the same adhesion problem on my MM pf. No problem ever since. 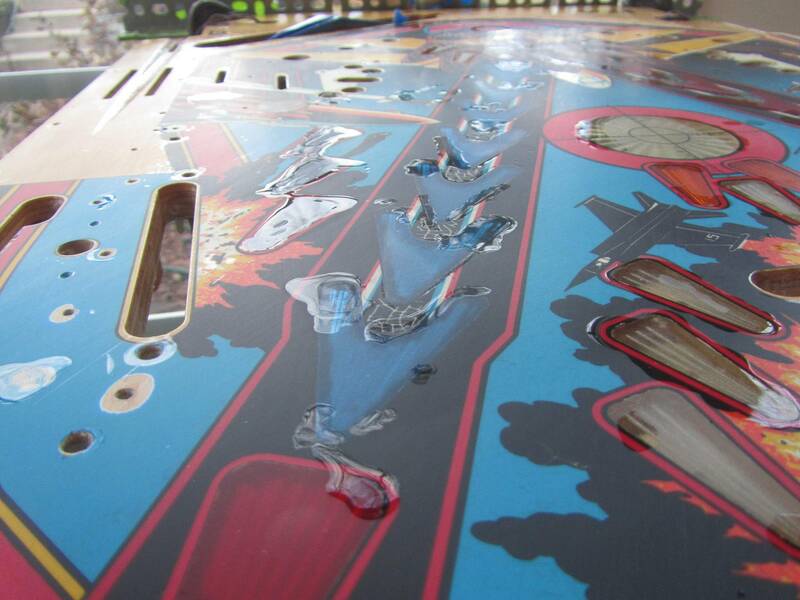 Contamination can be as simple as finger traces on the playfield, the grease you have on it (natural or from whatever you touched before) can do this mess, ask any car painter. 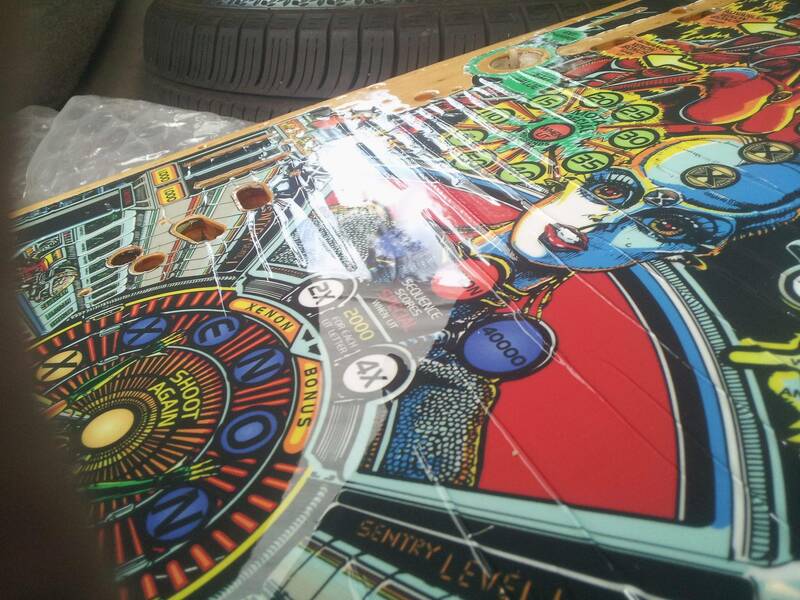 After the pf is degreased, I only touch it on the sides or from under it, never on the top where there is artwork. my second overlay came out very nice . What did you do different the second time? 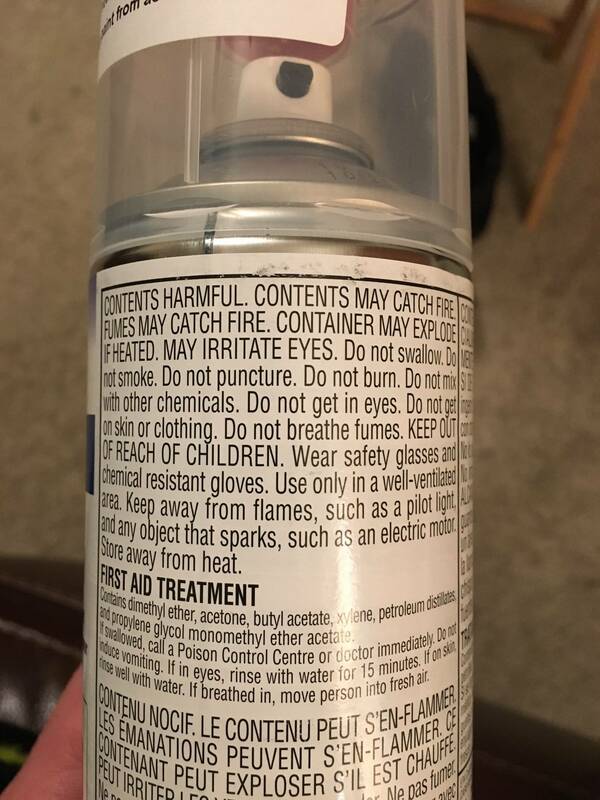 So it does not remove any paint? It sounds very strong. Don't suppose you have a pic handy? would be interested to see what that looks like. I'm just guessing but I imagine he used a much thinner first coat to avoid the chemical heat issues that caused his first overlay to wrinkle. The less you put on, the less heat generated and the less likely you are to "burn" the underlying surface. When it comes to paint, more thin coats is better. - spray third coat and if done properly should be good to go? Vid goes into a great amount of detail regarding how to do each step, and he also details steps for how to spray with automotive clearcoat the "correct" way which is to use a compressor and guns. I'm doing everything he recommends except substituting SprayMax for the auto clear. 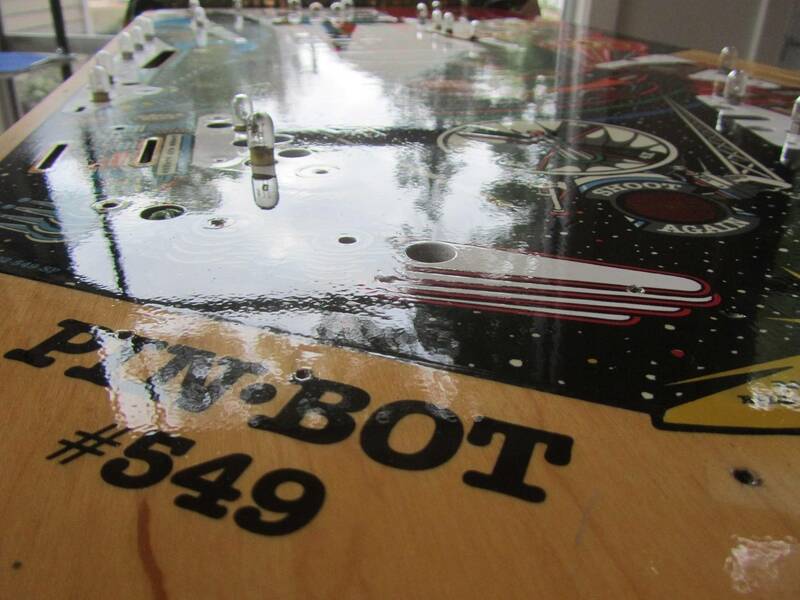 What you detail above is correct for my pinbot. I sanded with 800 to 1000 between coats. My second coat I actually sprayed it medium-thick and sanded that pretty flat before the third coat. The third coat was my thickest coat and looked perfect. I looked exactly as the F14 pics. It was the first coat(s), before touching up. I asked a pro painter (so it's not Spray2K but a professionnal 2 part clear) so I wasn't really happy with this... He wasn't worried as I told him I'll do my touch ups afterwards and get it back to him for additionnal coat(s) and was confident he would correct it. 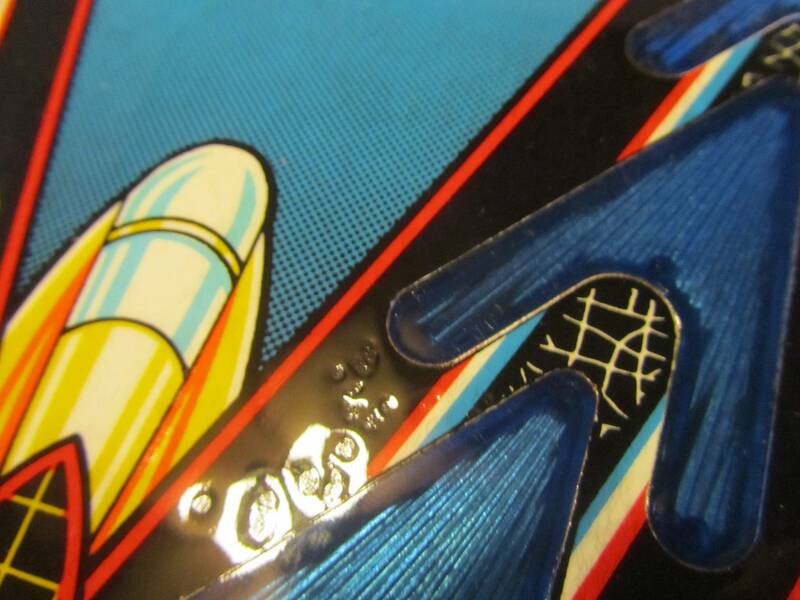 Pay attention to the reflection of the wireform ramp near the catapult, you can see it's "wobbly". Nevertheless it's not visible, and it's 99% flat so the ball movement isn't affected by it. It's reaaaaally subtle to see, no effect on gameplay. And it was like your F14 before... but keep in mind it's a pro guy who did this (the mistake, and then the correction). Needless to say I don't ask this guy anymore, but also I *always* use Motip degreaser before clearcoating. Just pass a soft cloth with the product on it, don't rub (it'll rub your touch-ups). 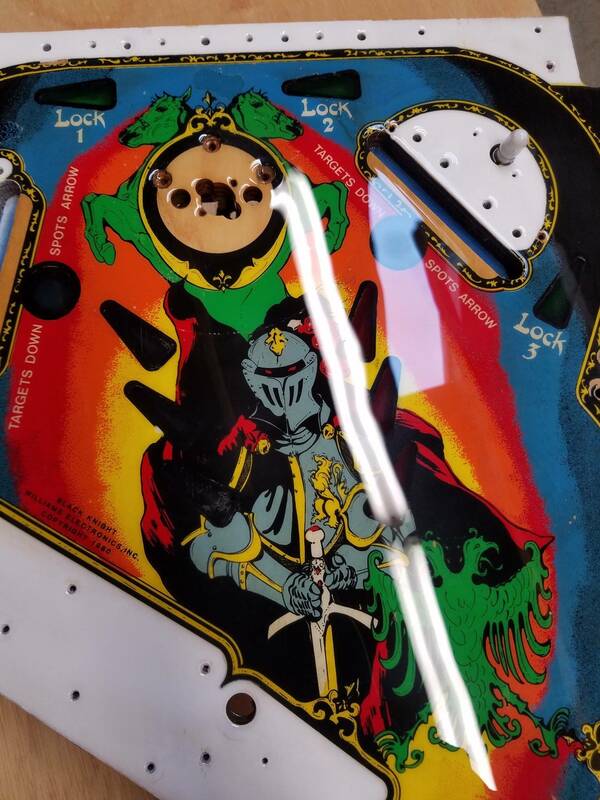 On a side note I had to replace a few insert decals (the "jackpot" ones, the left "joust victory" and the one under it, and "francois de grimm") and I was pretty happy to get them almost as "foggy" as the factory ones, and not crystal clear like on Stern inserts. 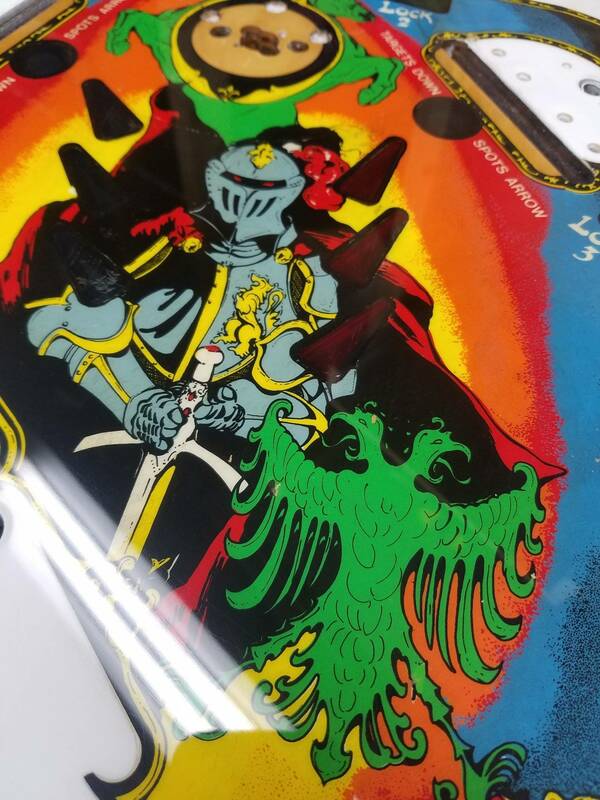 I put a few coats of matte varnish on the bare insert before putting the decal, then one coat of varnish on top of it (I was afraid they'll curl like the overlay above with a heavy coat of clear needed to fill the mistakes of the previous coat), and finally did my touch-ups as obviously for the "joust victory" you have to redo the yellow on the outside. You can see a small difference between "françois de grimm" and the other castle inserts, but again it's good enough for me. TL;DR: Don't worry, it's possible to fix these adhesion problem of clear with elbow grease. Always use degreaser before clearcoat. This is a great thread! I've been thinking of trying SM2k on a project game because I don't have a compressor/gun etc. Spray paint and I have a terrible success rate. I tried spraying an old guitar once and it came out a cracked mess in the end. I'm glad to see people are having some good results though. Makes me want to try it even more! Ok, first of all, your English is pretty amazing. 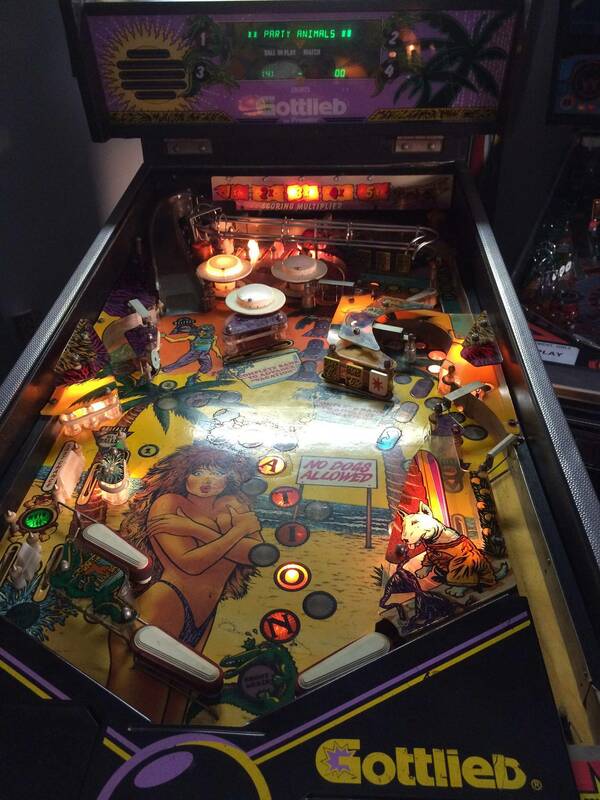 Thanks for sharing the story and the pics. I'll view them from home tonight. The google plus stuff is blocked from here. Makes me want to try it even more! Funny, I can't decide if I'm glad I found the stuff of sorry. Depends on the hour, I guess. I'm probably going to end up going the full HVLP setup at some point in the not so distant future. SprayMax does have pros in the pro column, certainly, but you end up losing the ability to tweak several things (spray pattern, flow, fish eye, mixture, etc. ).